You deserve a high-performing kitchen - why not start with a Vigo faucet for your sink. Stainless steel finish with matching soap dispenser all solid brass construction which ensures durability and longer life. Faucet features dual pull-out spray head for aerated flow or powerful spray. Includes a spray face that resists mineral buildup and is easy-to-clean. The Pekoe Semi-Pro takes style and performance to a professional level. Inspired by commercial kitchens, this faucet is for the serious cook. It brings professional level functionality and style to the kitchen and has amazing clearance for oversized pots. Also available in store by special order only see store for details. Stainless Steel Pull-Out Spray Kitchen Faucet with Soap Dispenser You deserve a high-performing kitchen - why not start with a Vigo faucet for your sink. Stainless steel finish with matching soap dispenser all solid brass construction which ensures durability and longer life. Faucet features dual pull-out spray head for aerated flow or powerful spray. Includes a spray face that resists mineral buildup and is easy-to-clean. 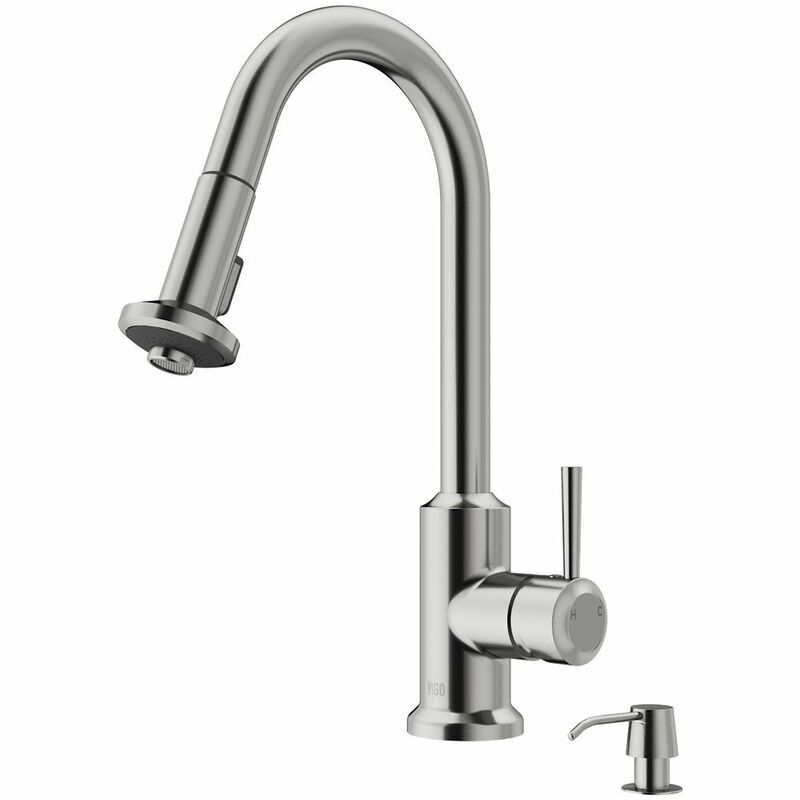 Stainless Steel Pull-Out Spray Kitchen Faucet with Soap Dispenser is rated 4.2 out of 5 by 27. Rated 4 out of 5 by Chef Dan from Still having issues After installing, the spray head compression nut came loose from the spray head, because the swivel is not function, so water started leaking all over my new cabinet. Also, the spray head does not come off the neck easily and is more difficult to put back in its locked position. I hope this is temporary and become easier as it wears in. Rated 5 out of 5 by Rally101 from Very cool Works really well in our corner sink. Has a good blend of classic and modern and appears to be built very well. Sturdy locking device for the pull out. Rated 5 out of 5 by Maryland DIY from Solid Construction - Tip for Installation Discovered a leak tuesday afternoon, ordered tuesday night from a leading home-improvement store, arrived thrusday mid-day, installed and working by dinner that night. The style is what caught my eye but let me say, I do a lot of DIY home improvement and the quality of this is top-notch, regardless of price, though the price is amazing! All of the fittings are precise, and even the supply lines that are included are a notch above what you'll find at your average home improvement store. One installation tip, the nut to tighten the faucet to the countertop is the EXACT same size as the nut for the heating element for an electric water heater. If you've ever used one of the specialized wrenches, it's literally a one-time-use tool (as in "what am I ever going to use this for besides this one job?"). Well, I found another use! The pass-through design of those wrenches works perfectly for this style of faucet. Saved a lot of time and frustration as it took all of 15 seconds to tighten with that thing. Put the channel locks away and go spend the few bucks on that tool! Rated 2 out of 5 by HomeDepotCustomer from When you pull down the sprayer head it does... When you pull down the sprayer head it does not go back up very easily. You have to keep pushing it to make it stay. I can only give it a fair rating. Sorry , If I had it to do over again I would’ve paid a little more and gotten a better one. Rated 4 out of 5 by Jimmy C from We love our new faucet! We bought this faucet because we wanted to replace our old pull-out faucet with a pull-down one. We are glad we did! We also like that this faucet is a few inches taller that our old one and we like the extra clearance for larger items in the sink. The install was easy (we did it ourselves) and everything fit perfectly. In addition, the faucet looks great. Very pleased so far. Rated 3 out of 5 by tchgrif from good faucet overall this faucet looks great and works fine other than how difficult it is to both pull down the spray hose and get it back into place. Rated 5 out of 5 by Roseapple from Pleasantly Surprised I bought the faucet even though I was discouraged, I'm pleasantly surprised how flexible this faucet is. It's very sturdy and addresses all my needs. Rated 5 out of 5 by Kk10 from Great to use This faucet is everything I was looking for! Works awesome in my vigo farmsink.